In this video, Dr. Dhavid Cooper, CEO of FramesDirect.com, discusses the impeccable quality of the company's optical lenses. I'm Dr. Dhavid Cooper, CEO of FramesDirect.com. At FramesDirect, we are obsessed with lens quality. Low quality lenses can have chromatic aberration, coma, and pincushion distortion. These flaws can scatter light and make your eyes work harder. There are over 100 brands of lenses to choose from, we only use the world's top four. 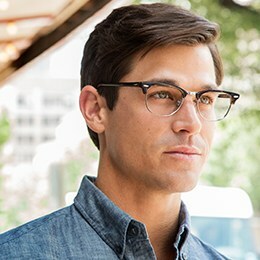 FramesDirect's high quality lenses mean clear comfortable vision. So the choice is yours; low quality or FramesDirect.